*Recent ruminations from LUPEC, as originally published in the Weekly Dig. March 3rd marks the birthday of blonde bombshell, Jean Harlow. Born Harlean Carpenter but affectionately known as “the Baby,” the actress would have turned 100 this week. Harlow’s career started as a happy accident when she drove a friend to an audition at Fox shortly after she moved to California with her first husband. Though fascinated by the studio environment, 17-year-old Jean had no desire to become an actress—even after her friend returned to the car with three Fox executives in tow, who produced a letter of introduction to the head of casting after laying eyes on the beauty. Weeks later she took them up on the offer just to win a bet. Baby Jean’s career came to an untimely end when she died from kidney failure in 1937 at just 26 years old. With over 40 films already under her belt, many believe she might have gone on to become one of the most accomplished actresses in American cinema. Here’s to Baby Jean. Shake in iced cocktail shaker & strain into a chilled cocktail glass. The Sidecar was a gateway cocktail for many of us LUPEC Boston gals, a drink that is not unlike the Manhattan and curiously still kicking in modern bars, despite its vintage roots. 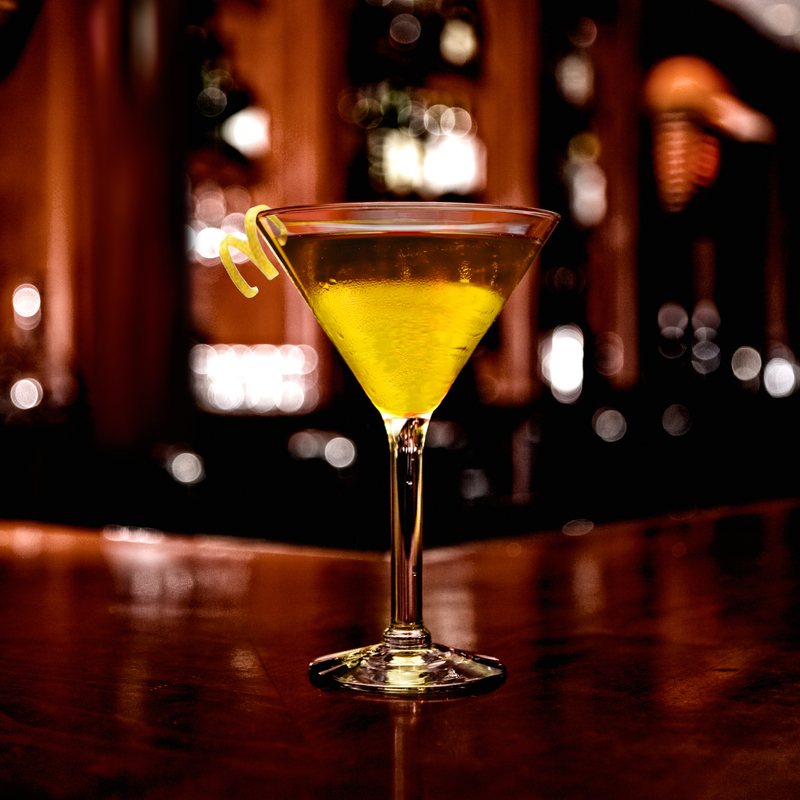 Many will claim the Sidecar was invented in the 1920s at Harry’s New York Bar in Paris. According to one charming story, the bartender whipped this up to quench the thirst of a US Army captain, a regular who traveled to and from the bar via a motorcycle and needed a tipple to take off the winter chill. But savvy cocktailians will recognize this drink as little more than an evolved Brandy Crusta. The Brandy Crusta was invented in the Crescent City by bartender Joe Santini, who took over at the New Orleans’ City Exchange in the 1850s. At the time, it was a unique blend of two different drinks—the “cocktail,” which was a short drink with bitters, and a “punch,” a long drink with citrus. Now, of course, we all drink “cocktails” much as we were all drinking “martinis” in the 1990s. But in those days, the category name had some relevance. The Crusta was enjoyed mostly locally, until Professor Jerry Thomas included instructions for how to mix it in his 1862 recipe book, The Bon Vivant’s Companion. By the 1890s, adding citrus to “cocktails” was de rigeur. Thirty years later, Crustas were out and Sidecars were in. Father’s Day is this Sunday. Instead of gifting dad a pair of cufflinks or another boring tie, why not treat him to a classic cocktail, perhaps enjoyed with a nice beefy steak? They’re serving an American version of the classic Sidecar, made with Jack Daniels and Triple Sec, over at Fleming’s [217 Stuart St., Boston. 617.292.0808. $9.95. flemingssteakhouse.com] during Father’s Day brunch. You can order this drink, the “Father Knows Best,” or stick to the classic recipe with cognac and Cointreau, listed below. Either way, raise a glass this week to dear old dad. Shake ingredients in an iced cocktail shaker. Strain into a chilled vintage cocktail glass. Serve with a sugar rim. What We’re Drinking: A Toast to Lady Day! *Recent ruminations from LUPEC Boston in case you missed ’em in this week’s Dig. Billie Holiday is remembered as one of history’s greatest jazz singers. Her haunting voice had a limited range (barely an octave), but she sang with a unique, laid-back style that was inspired by mellow legends like Louis Armstrong and Bessie Smith. Holiday passed before our time, but luckily, the Lyric Stage Company’s latest production, Lady Day at Emerson’s Bar and Grill, featuring Jacqui Parker as Billie Holiday, gives us a glimpse into Holiday’s live performance and backstage drama. Holiday’s life reflects the highs and lows of the Jazz Era. After a difficult childhood in Baltimore, she moved to New York City and sang for tips in Harlem nightclubs. She went on to perform regularly in New York, tour with Artie Shaw’s white band and make a number of recordings. A tough broad who would drink, swear and win big at dice (how cool is that?! ), she would also walk out on anyone who tried to control her. But the hard life and, oh yeah, some heroin abuse, took its toll; she died at the age of 44. The story of Holiday’s life (and its sad brevity) is just one example of what inspires LUPEC Boston to work with women’s charities. Our “cocktails for a cause” events help bring the Boston community together while raising awareness about the challenges many women face in realizing their full potential. One of the recordings (which featured Benny Goodman and Teddy Wilson) that launched Holiday’s career was “What a Little Moonlight Can Do.” We therefore raise a glass of this Gary Regan interpretation of the Aviation. Shake with ice and strain into a chilled champagne flute. SEE LADY DAY AT THE LYRIC STAGE COMPANY [140 CLARENDON ST., BOSTON. 617.585.5678. LYRICSTAGE.COM] THROUGH APRIL 24TH, AND FIND OUT MORE ABOUT COCKTAILS FOR A CAUSE AT LUPECBOSTON.COM. One of America’s most famous 1940s-era cabarets once glittered in our very own backyard. The Latin Quarter stood on quiet Winchester Street in the tiny Bay Village neighborhood, a cherry pit’s throw from where the old (and doomed) Cocoanut Grove nightclub once sparkled. 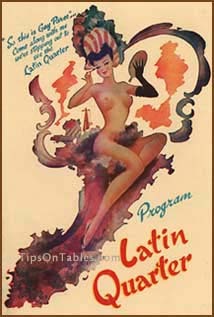 The Latin Quarter was known for its elaborate, “naughty but nice” revue. Featuring 6-foot-tall showgirls dubbed “long-stemmed roses,” national acts and Golden Era cocktails, this Parisian-inspired nightspot aimed high and ruled the roost for over two decades, spawning the big shows of Las Vegas. When owners Lou Walters (Barbara’s dad!) and Sonja and E.M. Loew (Loew’s Theatres) were bringing in half a million dollars per year, they redirected profits into building an LQ Miami, then the now-legendary LQ Times Square. 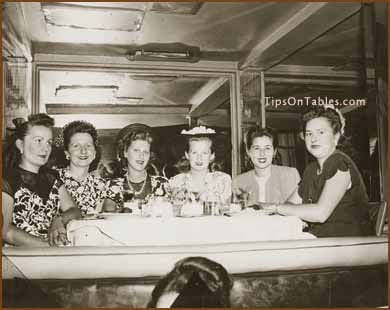 But after the Cocoanut Grove burned down in ’42, a damper was put on Boston’s nightlife. Officials temporarily closed LQ and 51(!) other area establishments to ensure they were up to code on fire inspections. A happy remnant of this nearly forgotten place has been preserved for us today: 176 cocktails, once poured by their bartenders, recently reprinted as Latin Quarter Souvenir Book of Cocktails & How to Mix Them by Halliwell Hobbes, an LQ historian. The book serves up both sterling classics and festive sips like Diamond Fizz, Americano, Bosom Caresser, Honey Bee, Harvard, Marconi Wireless and the potion we give you here. Thanks, LQ. Shake with cracked ice, strain into a cocktail glass and ornament with peel of a lemon. Raise a glass today – because you can! On this day in 1933 the 21st Amendment was ratified in Utah, the final state needed to repeal Prohibition by a three quarters majority, restoring the American right to manufacture, sell, and transport alcohol. 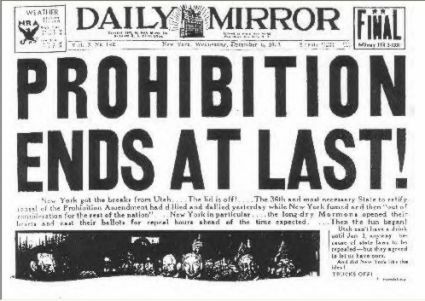 To learn more about Prohibition, why it became enacted in the first place in 1919 and enforced the following year, how it increased rather than deterred our nation’s desire for drink, and the ripple effects we still feel today, check out repealday.org. As you raise a glass, you can also check out this story from the LUPEC archives on Speakeasy owner, Texas Guinan, originally printed in the Weekly Dig last December. If there is any time to channel your inner flapper, it is this Friday: the 75th anniversary of Prohibition’s repeal. This week, the ladies of LUPEC raise a glass to those who kept the party going during those dry years, like the legendary Texas Guinan. Texas (née Mary Louise Cecilia) Guinan got her start on Broadway and then moved to Hollywood, where she starred in silent films. She played the first movie cowgirl in her debut, The Wildcat, and enjoyed several years as Hollywood’s “Queen of the West” before returning to New York in 1922. Soon Guinan was turning a fine profit selling illegal hooch at speakeasies like the El Fey Club, which she opened with gangster Larry Fay. She went on to open her own 300 Club, where she famously greeted guests with, “Hello, Suckers! Come on in and leave your wallet on the bar.” Booze, beautiful hostesses and chorus girls distracted clientele from the high-priced cocktails. Guinan’s joints were frequently raided by feds, but she never owned up to selling alcohol, innocently declaring, “A man could get hurt falling off a bar stool!” Re-opening after raids, she would sometimes wear a necklace of gold padlocks to show the cops there were no hard feelings. When one club was padlocked, she simply opened a new one. Guinan died on November 5, 1933, just a month before the end of America’s 13-year dry spell. The New York Times reported a crowd of “something like 10,000 to 12,000 persons” paid respects at her wake. We’ll pay ours by toasting the late, great Tex with one of these. CLICK HERE AND HERE TO READ MORE ABOUT TEXAS GUINAN.